The architectural practice of C.J. Falconer & Associates was established in 1986 by Christopher John Falconer. The practice has since grown organically to become a partnership to include Gareth Matthew Falconer and June Anne Falconer. C.J. Falconer & Associates work across the majority of project sectors, bringing in creative ideas from each industry. Our Blog is used for Research and Development of Ideas Only. The Projects included on this Blog are not neccesarily Live or Realisable. Concept – just as the Dandelion grows, flowers and matures, the seeds- the children, leave to new beginnings. 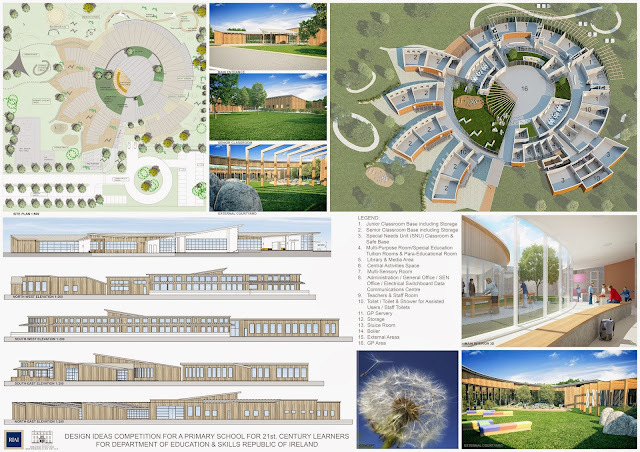 C. J. Falconer & Associate's design for a Primary School for 21st Century Learners, is derived from many layers. The initial planning of the design focused on accessing all areas of accommodation directly off the General Purpose Area- the initial layer, and there by forming a common meeting point and main thoroughfare of the school. The surrounding related concentric rings cater for inter related spaces and zoning.